Two indispensable qualities in a chef, don't you agree? Okay then it's us for dinner...Didge, Rooster, Virginia, and Julia! Hey Normal, that is now all changed, because I don't think this dinner-with-Julia could even happen without your presence! 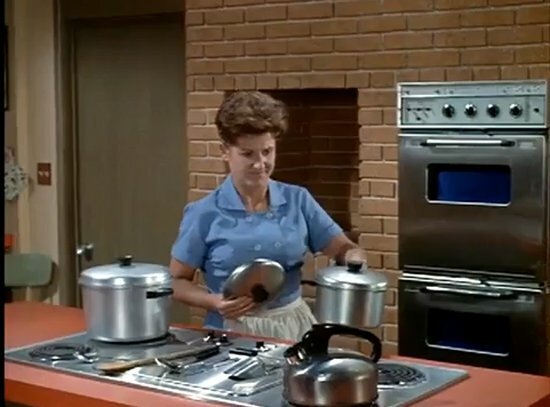 Alice from the Brady Bunch. I don't know any of the mentioned celebrity chefs, I never watch those shows. Maybe I should. Since I like Cajun foods, and Paul Prudhomme passed away last year, I will go with Emeril Lagasse. BAM! He was my second choice ! I love to watch Gordon Ramsay, but if I was actually going to eat.....I'd have to go Italiano! Mario Batali! Mario Batali ! Good Italian cooking ! There are so many I'd love to have. I guess I'd like Gordan Ramsey. If love to watch him make risotto That's one of his specialties and I've not attempted it as I see the possibility for my messing it up badly. Maybe slightly more realistically perhaps, Edward Lee. He's a famous chef with 2 amazing restaurants here in Louisville. Ah, but what would you food them, Otis? Payback time? Mine would have to be Bobby Flay and Rachael Ray! Wonder how a cook off between the two would be like! Yes sometimes. I never saw the one where he out cooked her. WOW! My kids like watching it so it's one I like on. :0) I will have to keep an eye out for it. I'll pass on this. One of my friends told me a story that would turn me off for life. She married the son of a chef and the first time he came to dinner she was very nervous. She cooked the most elaborate meal she could manage, frightened the whole time that something might go wrong. She worried in vain. She said it was perfect and she felt very proud as she placed it in front of him and waited for him to taste it. Then the oaf picked up a bottle of ketchup and smothered it with tomato sauce. She said, "I could have killed him." LOL! My mother in law did that with my husbands "famous" steak he puts on the grill. I do NOT like eating meat except for chicken and turkey breast, sometimes salmon. But my husband got a big head when I decided I actually liked his steak and was sneaking bites. He invited his mom over for the expensive steaks and was excited for her to try it, she poured ketchup all over it, he sent her home and never cooked for her again! LOLOLOL! I live near one of his restaurants and have met Guy twice. If you could have dinner with one person throughout history who would it be and why? If you could donate $25k to any charity/organization, which one would you choose? Girls, if you could sleep with any male celebrity who would it be? I would choose Zac Efron. If you could have an all-expenses paid trip to see any world monument, which monument would you choose?